One of our pride crops has just come in. 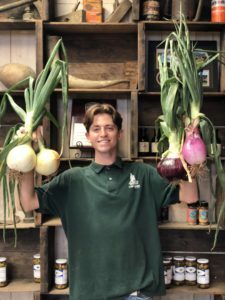 LJB has grown four delicious onion varieties, from sweet to spicy and in that order here they are. Walla Walla Yellows, Flat Italian Reds, Merlin Yellows & Red Torpedoes. These tasty monster onions are marked extremely low in order for you to enjoy your favorites all season long and try a few new ones.